I've got my first goodies from Sparkly Nails, some Hello Kitty style bows I recently purchased here. 3D resin blue polka dot bows, which I placed at a jaunty angle. (They lasted all day until I was changing my mani). This is also my first Illamasqua - Stance which a friend gifted me. It looks quite cerise here but IRL it was more purple. 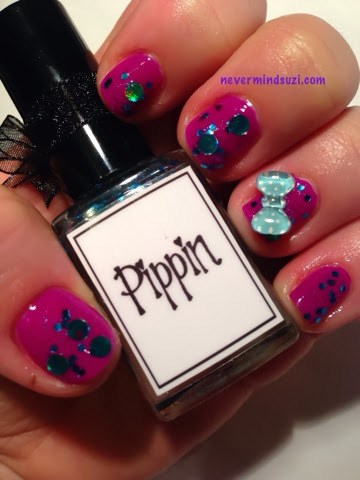 I was also lucky to get this fabulous Whimsical Nail Polish by Pam - Pippin. A friend of a friend sorted out this beauty for me. 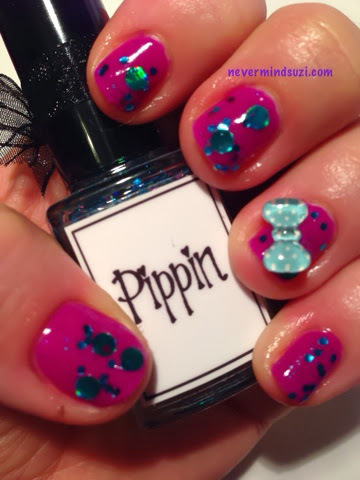 Pippin is a clear base with blue glitters and blue holographic circle glitters. I love, love, love circle glitters.